A conservative stalwart, Wisconsin Congressman Paul Ryan was elected as the new speaker of the U.S. House of Representatives Thursday, a day of pomp, celebration, high hopes and a rare spirit of unity in the House chamber. In a party-line vote over opposition Democrats, the majority Republicans in the House picked the 45-year-old Ryan to assume the top position in Congress. As Speaker of the House, he instantly becomes one of Washington's most politically powerful figures and second in line to the presidency. 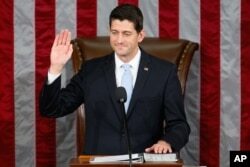 Ryan assumes his new position after 17 years in the House and becomes the country's 54th House speaker. He worked his way up, serving as a legislative aide and a waiter at a Capitol Hill Mexican restaurant before being elected to the House in 1998. He became chairman of the influential Ways and Means Committee in January of this year. Ryan succeeds John Boehner, an Ohio congressman who is leaving Congress after 25 years, the last five as House speaker. In a tearful farewell address, Boehner said he is retiring "with no regrets and no burden," having advanced a new government spending plan in his final days in office. The election in the House went smoothly after a month of turmoil among members of the Republican majority. Ryan received 236 votes, with only 10 Republicans voting for other members. Democratic Minority leader Nancy Pelosi got 184 votes from her party members, with two Democrats voting for other people. Ryan praised outgoing Speaker Boehner for his 25 years of service in Congress and for his personal integrity. But then, in his first speech as speaker, Ryan said the House is “broken” by partisan divisions and is not helping hard-working Americans. Newly elected House Speaker Paul Ryan of Wisconsin takes the oath of office in the House Chamber on Capitol Hill in Washington, Oct. 29, 2015. He asked the chamber's fractious Republican and Democratic lawmakers, often at odds with each other on an array of policy and spending issues, for a time of healing. Under his leadership, Ryan said there will be no settling of old scores. He promised a “clean slate” to start working on tough issues. The Wisconsin congressman, a staunch Roman Catholic, then called on his House colleagues to pray for each other, Democrats and Republicans alike. In a nod to the more conservative members of the Republican majority, Ryan promised a return to “regular order” procedures in the House, with congressional committees as the backbone of the chamber's legislative work. He said all lawmakers, regardless of seniority, would be encouraged to contribute to the legislative process, and he said there is no need to hide policy differences among the members. 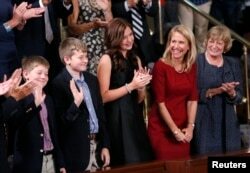 U.S. House Speaker Paul Ryan's family, from left, sons Sam and Charlie, daughter Liza, wife Janna and mother Elizabeth, wave to him from the gallery during the election in the House Chamber in Washington, Oct. 29, 2015. Differences should be embraced and discussed openly, the new speaker said. "If you have ideas, let's hear them," he told the lawmakers. "I believe that a greater clarity between us can lead to a greater charity among us." Ryan has a conservative voting record and is known as an expert on government budgets. He has rejected legislative attempts to resolve social and economic problems, such as poverty and income inequality, by enlarging the scope of the federal government. He is widely respected by many Democrats, even those who do not agree with his policies. When Ryan walked down the center aisle of the House chamber to accept the gavel and take over, he spent just as much time hugging and shaking hands with Democratic members as he did with Republicans, and received a warm welcome and standing ovations from the whole chamber. 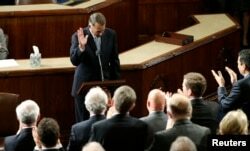 Outgoing House Speaker John Boehner departs the podium during a standing ovation after he addressed colleagues during the election for the new Speaker of the U.S. House of Representatives in the House Chamber in Washington, Oct. 29, 2015. First: Frederick Muhlenberg of Pennsylvania, elected presiding officer on April 1, 1789, the day the House organized itself during the First Federal Congress (1789–1791). Longest election: After more than two months and 133 ballots, Nathaniel Banks of Massachusetts was elected on February 2, 1856. Youngest: Robert Hunter of Virginia, elected on December 16, 1839, at the age of 30. Oldest: Henry Rainey of Illinois, elected on March 9, 1933, at the age of 72. * The Speaker of the House is second in line to the presidency. After his Republican colleagues selected him Wednesday, Ryan said the party's lawmakers "think the country is heading in the wrong direction." They often have attacked policies advanced by Democratic President Barack Obama, but have mostly been stymied in winning approval for conservative proposals on social programs and spending cuts opposed by the White House. "We have an obligation here in the people's house, doing the people's business, to give this country a better way forward," Ryan declared. White House spokesman Josh Earnest said, “The president has spoken publicly in the past about the respect that he has for Congressman Ryan despite their significant policy differences. The president is hopeful that he’ll be able to work with Congressman Ryan to make progress on behalf of the American people." Outgoing House Speaker John Boehner bid an emotional farewell to his colleagues. Known for his frequent tears, Boehner held up a box of tissues and waved it around before starting his speech. He did shed a few tears as he recalled his humble upbringing in Ohio, in a family of 12 children. In America, Boehner said, an unlikely success story like his is possible. Boehner, who is retiring from Congress, had vowed "to clean out the barn" before leaving office — resolving some thorny budget and fiscal issues that have provoked frequent showdowns and crises over the past five years. The House passed a two-year budget deal Thursday that will avert another showdown over government funding, and also increased the nation’s borrowing authority before current funding is due to run out November 3. The Senate is expected to pass the budget bill by Friday. Boehner had a wild ride as speaker, often caught between Democrats on the one hand and Tea Party members of his own Republican Party on the other. Newly elected Speaker Ryan will at least have some breathing room before he is faced with the next fiscal battle. Republican presidential nominee Mitt Romney chose Ryan to be his running mate in the 2012 election, when Obama won his second term in office. Romney and his wife, Ann, were in the chamber as Ryan's guests and got the first “selfie” photo with the new speaker after House members voted. VOA White House Correspondent Mary Alice Salinas contributed to this report.